The Balamutivska cave is located in the North-Eastern outskirts of Balamutivka village in Zastavna district, Chernivtsi oblast. It’s a natural monument of national importance. The entrance to the Balamutivska cave is in the upper part of the right slope of the Dnister valley. It’s quite a large grotto the sizes of which are quite impressive. It’s 20m wide, 15m long and 10m high. The cave itself is low and not too wide. The gallery height is about 1-1.5m and the width ranges between 1 and 2 meters. The cave is longer than 200m. The grotto bottom is full of plaster lumps. In the course of archeological research petroglyphic drawings from the Mesolithic period (10-12 thousand years B.C.) were discovered but, unfortunately, not in the best condition. 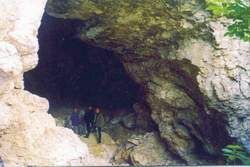 The Ducha cave lies 150m to the East from the Balamutivska cave. It’s a natural monument of local importance. The entrance into the grotto opens behind a plaster brow. The cave is about 144m long and 1-2m high. Cave walls are covered with a number of plaster forms. At the time the cave is being explored.